(Office of Her Majesty – Press Department – Canberra) - Her Majesty Queen Rania visited the National Portrait Gallery in Canberra on Wednesday, while on a State Visit to Australia with His Majesty King Abdullah II that includes visits to diplomatic sites and meetings with Australian officials, and aims to strengthen political and economic ties between the two countries. 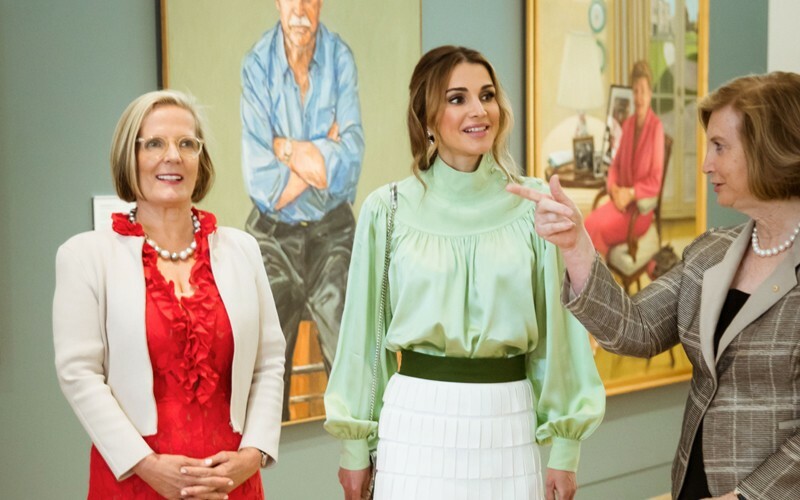 The wife of the Australian Prime Minister and Gallery Patron, Ms. Lucy Turnbull received Queen Rania, and joined her on a tour of the gallery, alongside its Chairman Dr. Helen Nugent, Director Mr. Angus Trumble, the wife of the Australian Ambassador to Jordan Ms. Marta Henriques-Pereira, and the wife of the Jordanian Ambassador to Australia Ms. Lubna Kraishan. While at the gallery, Her Majesty stopped to look at several important portraits, including those of the Gallery’s Founding Patrons Marilyn and Gordon Darling, the pioneering female pilot Nancy Bird Walton, the British explorer said to have discovered the Australian continent Captain James Cook, as well as a number of other self-portraits by female Australian artists. Other portraits at the gallery included those of former CEO of the Children’s Hospital Dr. John Yu, and the prominent barrister and former politician Tom Hughes. The National Portrait Gallery, which launched its first exhibition in 1994, is home to a diverse collection of portraits of prominent Australians. Originally located in the Old Parliament House, it moved to its current location in 2008 to accommodate a growing profile and collection of over 2,500 portraits. The collection includes photographs, prints, miniatures, cartoons, collages and caricatures, in addition to paintings and sculptures that document the history of portraiture and the various ways in which the genre has been explored in Australia.